Asian home decor items. Such as garden lanterns and Buddha statues. Large food dog statues for outdoors and entryways. As well as Chinese style vases and urns. 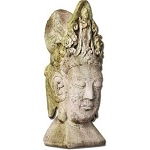 We also have a nice selection of Oriental wall masks and wall decor. Most of these pieces are outdoor suitable for year-round weather. You can also choose your finish of most of these pieces.